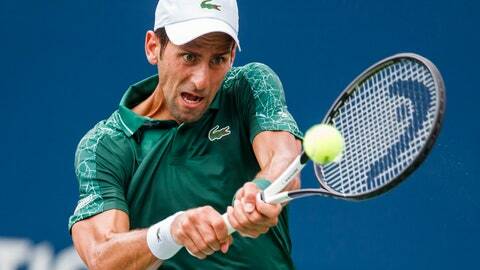 TORONTO (AP) — Novak Djokovic advanced to the second round with a 6-3, 7-6 (7) win over lucky loser Mirza Basic at the Rogers Cup on Tuesday. Wawrinka battled back, converting on 86 percent of his first service points to take the second set. He broke Kyrgios in the final game of the third set, converting his second match point opportunity when the Australian couldn’t handle his return. “Stan, for him to get through matches like this, healthy, no pain, that’s a good sign for him,” Kyrgios said. “He’s playing a good level. He’s got a world-class backhand and matches like this are going to give him confidence. In other matches, Robin Haase of the Netherlands downed Japan’s Kei Nishikori 7-5, 6-1. Americans Sam Querrey, Frances Tiafoe and Ryan Harrison joined Russia’s Karen Khachanov and Greece’s Stefanos Tsitsipas as other first-round winners. Tiafoe will face Canada’s Milos Raonic in the second round. The top-ranked Canadian in the men’s singles draw at No. 26, Shapovalov let out an emphatic yell when he sealed the victory in front of a cheering home crowd that included Edmonton Oilers captain Connor McDavid.